Our new mounts are MUCH stronger than stock, and are designed to handle 1400 HP+ while transferring power quicker, without any of the problems associated with solid mounts. There are NO negative effects to the block or knock sensor from using our Poly mounts. Our new mounts are MUCH stronger than stock, and are designed to handle 1400 HP+ while transferring power quicker, without any of the problems associated with solid mounts. 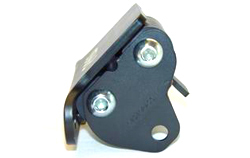 There are NO negative effects to the block or knock sensor from using our Poly mounts. They actually reduce the negative effects from using solid type mounts. They include the highest quality polyurethane bushings from a well known manufacturer that have been modified to be used with our design. They are soft enough to allow a slight amount of movement which reduces bind/stress, and also stiff enough to keep the engine where it is designed to be under full power. There is also added clearance over the stock mounts for after market oiling systems, and they should NOT need any additional modifications. For most street cars/daily drivers, upgrading the drivers side along with a GM passenger mount in very good condition will work fine. For engines over approx. 500 HP, a pair is recommended for the best possible performance, as well as safety. 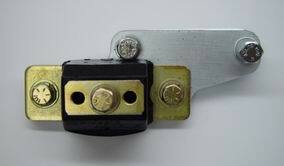 If there is minimal clearance around the engine and excessive movement could cause problems, then a pair will also be much more helpful in keeping the motor in place. If an upgrade to a NON-Buick production 3.8 block is in your near future, it would be wise to consider our “second design” in the photo on the left. Our “second design” will fit Stage I & II blocks, and ALL GM production V-6′s in the above body styles. Part# 0104 is for a pair of the second design Poly motor mounts. The second design is basically the same as the first design, except for added clearance machined into them for proper fit against the sides of the other blocks. The second design can only be purchased in pairs due to the much higher HP potential. Both styles are made from all new parts and materials, and assembled with precision CNC machined jig fixtures. To ensure the highest degree of quality, parts are laser cut and manufactured to precision tolerances with CNC equipment. They are welded with a state-of-the-art high frequency mig welder and include grade 8 (or better) hardware. A 3/8″ hex bit driver for use on a ratchet will be needed to install while the motor is in the car. We offer this tool separately (Part #0199) for those that may not have one. If the motor is out of the car, a standard 3/8″ Allen wrench may also be used. We keep these motor mounts in stock this means there is no waiting as they are sitting on the shelf waiting to be shipped. 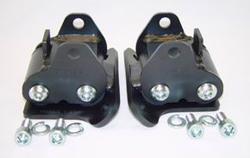 We stock both stage style motor mounts and Stock block motor mounts. This warranty does not cover any failure due to abuse, accident, or neglect. The liability of the manufacturer shall not exceed the original purchase price of the unit. Read More..